Case of 12 KJV The Open Bible in hardback. Our case qty. price ($25.99ea.) is 35% off the list price of $39.99. The study Bible that gets you quickly and fully into the Word. Find what you need! The Open Bible, King James Version is designed for the hungry reader. This Bible is filled with amazing study aids including comprehensive book introductions and outlines, 64-page concordance, Read-Along references and translation notes, and the classic Biblical Cyclopedic Index covering more than 8,000 textual entries. 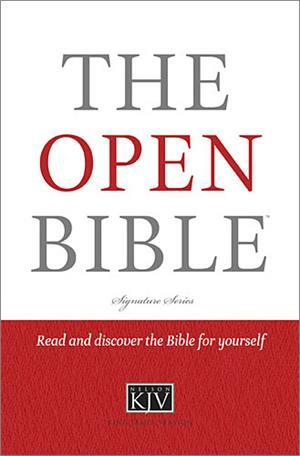 The Open Bible, King James Version also features a seven-step method on How to Study the Bible, a Visual Survey of the Bible, The Christian's Guide to the New Life, and The Greatest Archaeological Discoveries of the Bible. This outstanding Bible is available in hardcover and bonded leather.